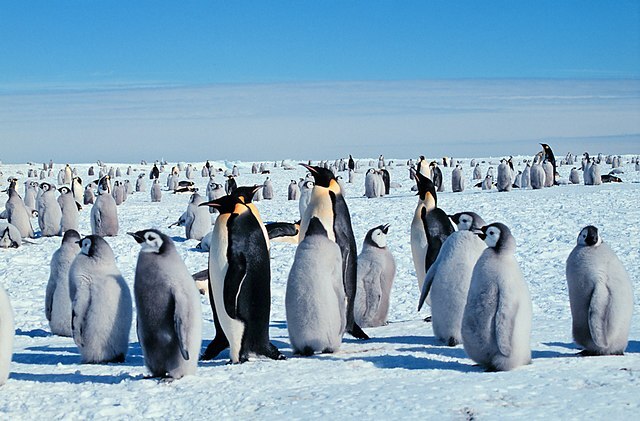 Emperor Penguin colony. The adults are the size of a large dog. The Emperor Penguin (Aptenodytes forsteri) is big, as birds go, and as graceful underwater as it is ungainly on land. Its native habitat is Antarctica, and until recently, the bird has been considered ‘sea-ice obligate’, meaning it breeds and forages from sea-ice platforms. The species hasn’t been considered under threat for time being, but given the changes that are occurring in its one and only habitat and the increasing instability of sea ice platforms, most long-term predictions are less than optimistic. The Emperor likes to nest at the same sites year after year, and those sites do not always oblige any more by appearing in a timely manner. However, the Emperor Penguin’s strong preference for keeping a regular breeding address might be matched by an unexpected adaptability in another area: its previously unknown climbing skills and its willingness to try something new. Emperor Penguins on the edge of the Larsen Ice Shelf near the Jason Peninsula late in the breeding season. Note the ice cliff which is probably an insurmountable barrier to the adult emperor penguins. No evident route to the colony was determined from the images. A new study has shown that there are colonies of Emperor Penguins that have reacted to the unreliability of sea ice in their usual spots by relocating to a higher elevation on a permanent ice shelf. 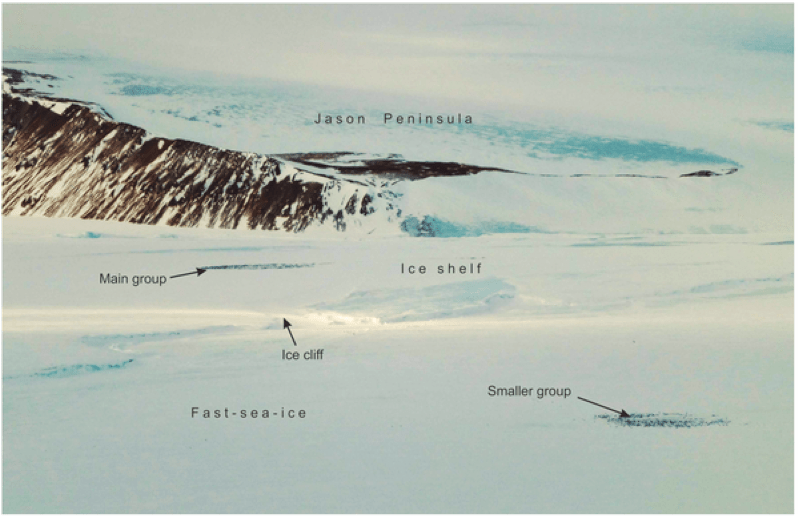 It seems that thousands of penguins, rather than look for new sea ice platforms, instead trekked up sloping ice creeks and gullies to safer locations. This doesn’t mean the species isn’t threatened by climate change in the long run. Rather, it’s a surprising and positive illustration of adaptation to rapidly changing conditions.